To turn the blank area of the HomeVision application main window into something useful, it now contains the Terminal Emulator window. So no more need to explicitly open it. It is just always there ready for you to send commands to the controller. When using the terminal emulator it frequently happens that you want to send a command similar to one sent before. Using the arrow keys you can just go back through the list of commands given, edit one if necessary and excute the command again. With the Terminal Emulator window always on the screen, the need arose to get some translation of the standard cryptic messages from the controller. References to objects in the standard messages are automatically translated to the object name which is then appended to the message. To indicate this is not part of the message received from the controller, the object name is displayed in a different color from the rest of the message. 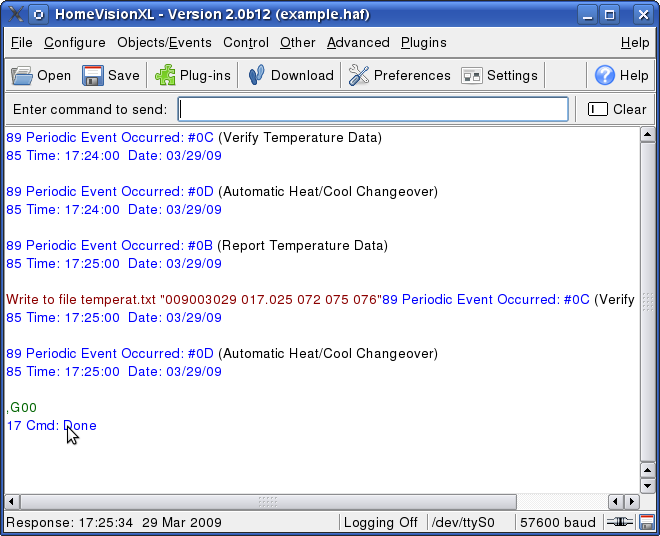 While looking at the communication between HomeVisionXL and the homevision controller in the terminal emulator screen, it is sometimes interesting to know when the displayed commands were issued or when events happened. The status bar of the HomeVisionXL main screen will indicate the timestamp and the direction of the information the mouse points at.